I’m Meaghan, a 24 year old fitness blogger. I’ve taken spin classes since I was in high school, but about two years ago I took my first Flywheel class while visiting a friend in NYC. I’ve been hooked ever since! Every time I’d visit NYC after that, I always made sure to make time for a class until I finally moved here last summer. Ironically, weeks after I moved, Flywheel opened in Boston, so every time I go back and visit, I make time for a class there. I love Flywheel because I know I’ll get pushed to my limit in every class. Your instructor makes or breaks your spin class, and Flywheel’s high standards for instructors means that whenever I go, whatever city I am in, I’ll get a great workout. When I’m on the go, I appreciate not having to “figure out” who are the best instructors- they are all great. Flywheel is a popular spin studio started in New York City by Ruth Zukerman, one of the founders of Soul Cycle (maybe you’ve heard of it?). Ruth branched out and started Flywheel in the Spring of 2010, and there has been a Flywheel vs. Soul Cycle war going on ever since! Since opening in the Flatiron district, Flywheel has expanded to multiple US cities, cruises ships, and even has a location in Dubai. Recently, the addition of Flybarre has added barre enthusiasts to their fanbase. The statistics element of Flywheel is what really sets it apart from other spin studios (more on that below!) This is a workout for those who are competitive- either with others or with themselves. The class won’t let you slack off- if you do, you’ll be last, and most people don’t like to be last. -In a 45-minute Flywheel class, you can expect great music, a heart pounding cardio workout, arm work with weighted bars, and an extremely motivating instructor. -Each bike has tracking devices that track your RPMs, torque, speed and distance. If you opt-in during registration, these stats are displayed on overhead screens during “races,” where you can literally race against the rest of the class during short sprints. Additionally, your stats are stored in your private account on the website, so you can track your improvement over time. 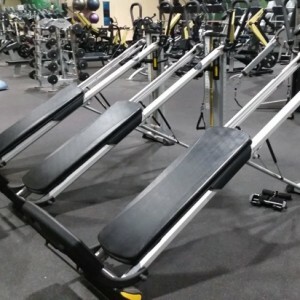 -The instructor will suggest RPM and resistance levels for you to work towards throughout the class, although in the end, it is your workout and only you can adjust the resistance levels or speed. If you are a beginner, there is no shame in simply working as hard as you can, no matter what your numbers are. Comfortable workout clothing- the ‘uniform’ at Flywheel seems to be Capri tights and tank tops- nothing too baggy that could get caught in pedals or handlebars. Additionally, Flywheel sells their own line of clothing which is popular amongst devotees. 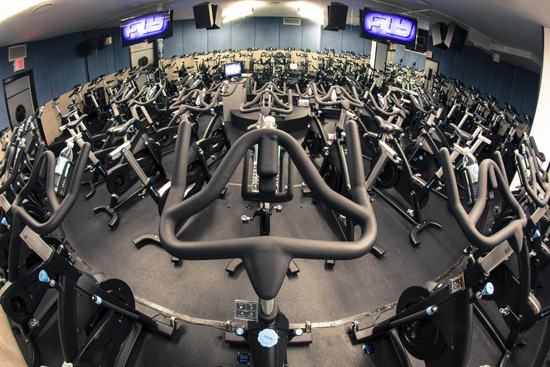 You can borrow a complimentary pair of spin shoes upon arrival, and there are several staff members available before class to help you clip in to the bikes. -You are guaranteed a great workout. I have never walked out of a Flywheel class feeling like I could have worked harder, or gotten a better workout. It will push you to your limit every time- no matter how uninspired you may have felt before class! Flywheel’s slogan is “never coast,” which I think is perfect-there is no way you’ll go into class and not be inspired to push yourself! -As a numbers nerd, I enjoy being able to track my improvement on the website over time. There is something about knowing those numbers will be stored FOREVER that makes you want to push just a little harder during class. -Free spin shoes! Other studios charge you up to $5 to use their shoes, but at Flywheel they are complimentary. -The focus on statistics can make it hard to “lose yourself” in the class. Sometimes you want to get lost in the music and forget about everything else, and at Flywheel that is a little harder because you are constantly checking your numbers on the little screen on your bike. -Price. Flywheel isn’t cheap- prices vary depending on the city, but in NYC, classes are $32 a pop. These prices are on par with other classes in the area, but an expensive 45 minutes nonetheless. 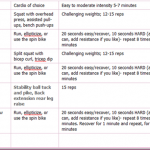 Have you tried Flywheel? Do you think it’s something you would love?? 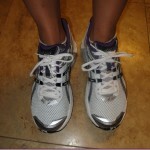 I blog most days at New York Views & Nike Shoes (http://nyviewsnikeshoes.com)- stop by and give it a read! I write about fitness classes I take around the city, marathon training, and my experiences exploring my new city. I incorporate class reviews, the occasional interview and giveaway, and some of my (beginner!) photography. I hope you get to try Flywheel soon if you haven’t already- drop me a line at my blog and let me know how you like it, I’d love to hear from you! 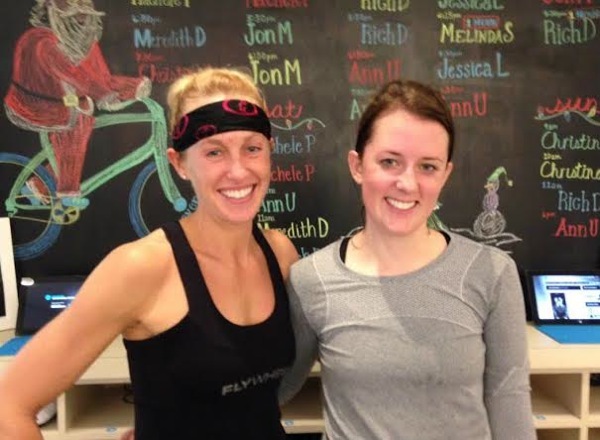 I recently was invited to a bloggers class at the Flywheel in boston (my review is here: http://burpeestobubbly.com/2014/02/18/indoor-cycling-at-flywheel/) and loved it. I have to say, I liked my class at Recycle Studio in Boston better, but really, any indoor cycling class (not spin class), is going to make me happy- the instructors at these “boutique” studios are really amazing! I went to Recycle every day for about two years before I moved to NYC! They are wondeful- I’m actually featuring an interview with their founder on my blog this week! I wish a studio would come to Michigan because I am dying to try a class! Spinning is one of my favorite forms of exercise, so I am really interested in trying out a Flywheel class. Looks like fun! I love to spin and have heard of Flywheel before, however I don’t think I could spend that much money on a class! It would be something I would like to try one day! I LOVE Flywheel! I try to visit the Chicago studio every chance I get. I love Flywheel. It is my go-to place for spin classes! I find the suggested RPMS and Torqs really challenging and I love the Leaderboard. Great post! I live in LA and have been spinning at Flywheel here once a week for just shy of a year. I’m very faithful to the one instructor (Tevia C-R) I always take from even though I suspect all the instructors are amazing. I agree with Meaghan that the tech aspect is really something that sets this workout apart from other spin studios. It’s much easier to hold yourself accountable to the prescribed resistance when it’s digital and you know EXACTLY where you stand. It’s also fun to check your progress over time. I have to disagree though that the numbers make it hard to lose yourself in class. 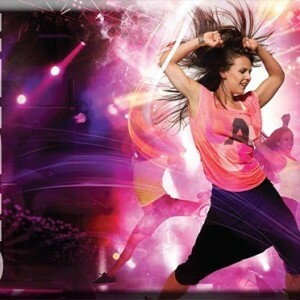 I routinely spin large parts of the class with my eyes closed especially if I’m really feeling the soundtrack. I know Flywheel isn’t the only studio to employ this practice, but I also really enjoy that class takes place in the dark. There’s something about the dim lighting that really elevates the energy of a large class. Maybe it’s that it’s hard to feel self conscious when not even your neighbor can see you, so everyone’s energy is really focused on their own workout and not what anyone else is doing. I’ve had some really magical moments at Flywheel as ridiculous as that might sound. There’s just something about the point 3/4 of the way through class when the sweaty floodgates are wide open and the endorphins are in full effect and the instructor will ask your to dial up the resistance even though you’re sure you can’t possibly be working any harder and then someone in the back will hoot, and soon half the class is hollering “yeah!” because it just. feels. good! I actually haven’t heard of this yet but really would be interested in taking a class! IT looks like something I would love in addition to my running. i’ve heard tons of great things about soul cycle, so i’d love to try flywheel the next time i visit new york! I haven’t tried this yet. I love spinning so I think it would be great. I fell in love with indoor cycling a few years ago, and got Spinning certified because I love it so much! I’ve never tried Flywheel, but I’ve heard about it. I’m super loyal to my studio! One quick little thing I feel the need to say (which I learned when I got my Spinning cert): “spin” is not a verb. Spinning is a trademarked method of indoor cycling. So unless Flywheel actually uses the Spinning method, they can’t be called a spin studio. Just sayin’. Sounds like a fantastic workout, but I’m not sure I’d be willing to pay $32 for one class — a bit too steep for me! I am a complete SoulCycle addict, but I have to say…not too crazy about FlyWheel. I just don’t really dig the OBSESSIVE reliance on numbers and competition. To me, SoulCycle is by MILES a better workout, but it doesn’t need the uber competitive, and often embarrassing, aspect that Flywheel has. Flywheel instructors honestly cannot even hold a candle to SoulCycle instructors. SoulCycle is where it’s at BY FAR!!! 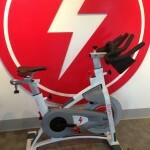 I’v been wanting to try FlyWheel in Charlotte, but I’m a little intimidated! I love Flywheel Cycle! I took my first class at Reebok’s Sweat USA in Miami last year. I love the competitiveness with the stats. I recently moved from SoCal to Seattle where there is a studio within 10 minutes walking of my apartment. I am a fitness class junky and after living in NYC for 2 years, have tried practically every workout class/boutique there is (soul cycle, barry’s bootcamp, bar method, physique 57, equinox classes, pure yoga, and more). I have truly enjoyed the vast majority of the classes I’ve taken, but something about the combination of flywheel and flybarre has been completely life changing for me. I have always worked out 5-6 days a week, but since joining Flywheel/Barre my body has completely changed for the better. I’ve never seen results like this EVER. I highly suggest trying out the combo if you have one near you. I generally try and take 3-4 barre classes and 1-3 spin classes a week depending on my schedule and whether I’m feeling like getting in more toning or more cardio. The instructors make everything so so fun and are completely understanding of the fact that I am no “ballerina.” Some studios offer the first class free so I highly suggest that fitnessista readers check it out. I’ve already got several of my friends hooked! i’m even more excited to try it now! Yay! I love your review. I get my flywheel/flybarre fix whenever I go to New York too. I really like that there are statistics because it helps keep me honest about how hard I am working. I also really like the barre classes, which are choreographed and lots of fun. I’ve never even heard of flywheel until now! Interesting! It sounds awesome! I can’t wait to try that out!